The Vienna Philharmonic Gold coin has been first minted by the Austrian Mint in Vienna in 1989 being the first and the only regularly issued bullion gold coin to be denominated in Euros. The Austrian Mint is one of the oldest institutions in the world that has been continuously producing coinage and currency for over 800 years and one of them is the Gold Philharmonic coin. 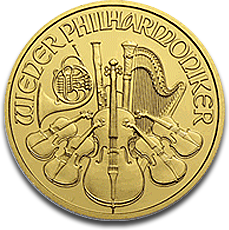 The Vienna Philharmonic Gold coin is also the only European legal tender produced on a large scale. The Vienna Philharmonic Gold coin can be considered unique because it has circulated with two different currency values being amongst one of the few. From the first time it was minted in 1989 and until 2001 this Austrian gold coin was denominated in Austrian Shillings and beginning with 2002 in Euros. The uniqueness of the Gold Philharmonic coin can also be assumed when taking into consideration that is the only bullion gold coin to be featured on the side of an airplane, on an Austrian Airlines Airbus A340. It has a 99.99% fineness being made of pure gold (24K) and it is considered by many collectors the most attractive standard bullion gold coin on the market. The Vienna Philharmonic Gold coin is legal tender in Austria and is a popular coin for investors but most of the times it ends up in private collections being renowned for its beauty, high quality, and purity. The Gold Philharmonic coin is minted every year in four different face values, sizes, and weights, the 99.99% purity remains the same for each of them. The largest size in which is produced the Vienna Philharmonic Gold coin weighs 1 ozt and has a face value of €100. With a face value of €50 is the Philharmonic Gold coin that weights 0.5 ozt. The last two weights of the Austrian gold coin are 0.25 ozt with its corresponding face value of €25 and the gold coin that weights 0.1 ozt with the face value of €10 Euro. The designer of all Vienna Philharmonic Gold coins is made by Thomas Pesendorfer. On the obverse are designed a set of musical instruments (string bass, cellos, violins, a bassoon, harp and Viennese horn) that symbolize the Vienna Philharmonic Orchestra. These instruments are accompanied by the text written in an arc across the top Wiener Philharmoniker which means “Vienna Philharmonic”. The obverse is representative for Austria’s rich musical heritage. The reverse depicts the concert hall in which performs the Vienna Philharmonic Orchestra. On the obverse of the Vienna Philharmonic Gold coin we find the image of the “Great Organ” and the text “REPUBLIK OSTERREICH” also in an arc across the top as well as the weight in ounces, the country of issue, the purity, and the face value in Euros. Prior to 2002 the face value was expressed in Austrian Shillings. To demonstrate the popularity of the Gold Philharmonic Gold coin is suffices to say that in 2004 fifteen Vienna Philharmonic Gold coins sold within two weeks of offer. In order to mark the 15th anniversary of this Austrian popular bullion coin the Austrian Mint minted fifteen 1,000 troy ounces (the equivalent of 31.103 kg) Gold Philharmonic coins, each of them having a face value of €100,000. The 1,000-ounce Austrian Gold coin is recognized by the Guinness Book of World Records to be the world’s largest gold coin. It took 130 hours to mint just on 1,000-ounce Gold Philharmonic coin and the relief on the coin was sculpted by computer and finished by humans. There is no doubt that besides being popular means for investors to diversify their portfolios because it is a secured and international recognized gold bullion coin, the Vienna Philharmonic Gold coin is beautiful, pure, and perfect from a technical point of view.